One of the most fascinating presentations at GITA was delivered by Gary Stoneham of the Department of Sustainability and Environment (DSE) of the Government of Victoria. Gary is an economist who focuses on creating new markets. Markets are an efficient, decentralized way of selecting efficient producers, each of whom has its own cost structure and private information. Examples of new markets that have been created include landing slots at airports and electric power markets. Markets that are being created include cap and trade markets for emissions, such as has been introduced in British Columbia this year. Australia intends to introduce a cap and trade market in 2010. Gary had been involved in developing a market for conservation contracts. The concept is that a land owner is paid for implementing measures that conserve the land, such as preventing grazing. The amount that the farmer receives is determined by an auction, in which land owners bid for conservation contracts. The market ensures that the most efficient "conservers" are rewarded. The DSE has defined an objective function that is used to estimate conservation value comprised of a spatial database on a grid with 20 m x 20 m cells that includes things like rainfall, demographics, and land use that allows the DSE to simulate the impact of remediation and estimate the value to the State of Victoria. This represents a new role for geospatial information systems. Several pilots have already been successfully run in Victoria, and it appears this program may be implemented across the State. It appears to me that this market-based program is in direct contrast to government subsidy programs like CAP in the European Union, which distributes billions of Euros in farm subsidies to farmers based on a system of tying payments directly to an assessment of the agricultural suitability of land. For example, Sitewell has implemented a web-based LPIS system for the Ministry of Agriculture in the Czech Republic to allow the on-line assessment of agricultural suitability with direct payment to the farmer. I have been at GITA Australia this week, with about 300 other people. There have been some absolutely outstanding presentations at this conference. Among them is a presentation by Jose Diacono and Danny Broadbent who are associated with the Victorian Spatial Council. At the last SSI Conference in Hobart, Tasmania, Tim Barker and Neale Hooper of the Queensland Treasury gave a presentation on their efforts to encourage the Government of Queensland to create a common data licensing framework based on Creative Commons licensing. I blogged about their presentation because I believe this is a critical issue that is facing most if not all government organizations who manage geospatial data. The Victorian Spatial Council has gone several steps further along the road. They have developed a framework for sharing based on licenses and metadata, not only within the Government of Victoria, but also among utilities, telecommunications firms, National Government, other government, quasi-government, and non-government organizations. The program is based on the 2008 Victorian Spatial Information Strategy, and incorporates the concept of custodianship. They are encouraging organizations with data to share to participate in the program as data custodians. This is a voluntary program, not mandated by legislation. There appears to be a lot interest in the program within the Government of Victoria and also among utilities in the State. It appears to provide a relatively simple, practical solution for a legal framework for data sharing that it would be worthwhile for federal, state, provincial and local governments around the world to take a look at. For example, it includes data licensing agreements that become operative at the time of an emergency. Digital Cities: Where does the data come from ? Earlier this year, GITA hosted an Emergency Response Symposium (ERS), organized by Talbot Brooks of Delta State University, as part of GITA's 2008 annual conference. Doug Eberhard, Tim Case, Dan Campbell, and I were part of a panel that discussed the convergence of BIM, CAD, GIS, and 3D simulation, digital cities, and some of the implications for emergency response. Joe Francica of Directions Magazine was in the audience, and asked a very important question which I will paraphrase. Where does the data come from ? Afterward Joe wrote an insightful article about this discussion. Recently, I discussed the same issue with Kenneth Wong of Cadalyst magazine. When we talk about modeling cities digitally, we are talking about modeling the infrastructure of a modern city including buildings and other structures, transportation networks, and utility and communications networks. We need to be able to visualize the city photorealistically, and we also need to be able to analyze how it works, and simulate how it would might work under different conditions. The relatively recent introduction of new technologies has dramatically improved our ability to efficiently image cities digitally in 3d. Advances in aerial photogrammetry and the widespread application of laser scanning are making 3D imagery available for many of the cities of the world. For example, Vexcel, now part of Microsoft, has developed cameras that enable the efficient creation 3D building models, rectangular solids with textures draped on the exterior walls, with a precision on the order of centimeters. Other technologies such as LIDAR and mobile terrestrial laser scanning are also being applied to create high resolution 3D cityscapes. To image the inside of buildings and structures such as electrical sub-stations, terrestrial laser scanning can generate imagery with sub-centimeter precision. Technology even exists for subterranean imaging of utility and communications networks. In addition to being able to visualize cities, it is also important to be able to analyze how cities behave and to simulate how they might behave under different circumstances. 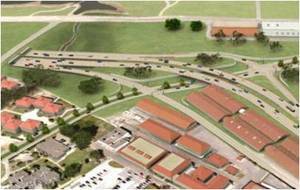 Analysis and simulation is easier to do when the infrastructure data has intelligence. For example, capturing connectivity enables tracing an electrical network from a failed transformer to determine the customers affected so they can be contacted. Similarly, an intelligent transportation network model facilitates determining possible evacuation routes. In the 1980's utilities and communications companies, realizing that their paper-based business processes were inefficient and were hindering their ability to provide new services to a growing, more affluent population and with the example of the successful replacement of paper and ink engineering drafting by CAD technology, began converting their paper engineering drawings into digital form. The conversion process required an expensive, multi-year effort, but the result is that for many cities intelligent digital utility and communications network models are available. Most of these models include not only location and properties, such as rated voltage and installation date, of each item of network infrastructure, but also connectivity, for example, which electrical networks are connected to which transformers. Similarly, topological network models also exist for rail networks and other transportation networks including roads and highways. In a similar vein, intelligent digital models are required for buildings and other structures. For example, it may be necessary to model the propagation of smoke or a noxious gas through the heating and ventilation system of a building, conduct a finite element analysis to determine the structural stability of an impaired structure, or determine evacuation routes form the upper floors of a high rise. 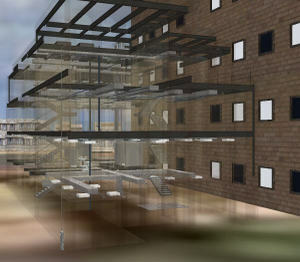 The data required to model buildings often already exists because it was created when the building was designed. It may be in the possession of the owner and designer, an engineer or architect. But it also may be at city hall or the town council, because most municipalities' permitting process requires the submission of engineering or architectural drawings. The permitting process usually requires that these drawings be made available for public inspection at city hall or the town council offices. After the public review process is completed and a decision rendered on the permit application, these drawings are archived, either in their paper form, on microfiche, or using a digital document management system. For older buildings, these drawings are paper. For buildings designed since the widespread adoption of CAD, they may be available in both paper and digital form, as a DWG or DGN file. For very new structures, it may be possible to find both paper and an electronic building information model (BIM). Some municipalities, such as the St Johns River Water Management District in Florida, are actively encouraging electronic submissions. It is interesting to what extent municipal governments make use of these drawings after the permit has been issued and the structure built. In some municipalities, it appears that they are archived, and no further use is made of them. But in some municipalities the value of these drawings is recognized, and they are being used for a variety of purposes, among them, emergency planning and first response. For example, the fire marshal may find that the drawings are invaluable for emergency preplanning or the police may find the drawings reduce risk to personnel responding to an an emergency situation in a bank or at an airport. 1) How should municipalities be encouraging the submission of intelligent, digital designs, for example BIM models, as part of the permitting process ? At the federal level the GSA in the US requires BIM models for federal projects. 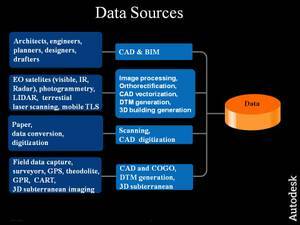 The analogous organization in Singapore recommends BIM models. 2) How do we overcome issues of intellectual property rights and security that hinder reuse of this data ? 3) Can we expect to see the conversion of paper drawings to digital form and the capture of critical infrastructure intelligence for buildings and other urban structures analogously to what happened beginning in the 1980's at utilties and communications firms ? One of the advantages of travelling as much as I do, is that I have a high probability of meeting interesting people who are doing very innovative things. I'm currently in Australia to attend next week's GITA conference in Sydney, and on my way here I ran into Sam Majid of Ennoble Consultancy in Melbourne. Sam, whom I have known for several years, has implemented a classic architectural design pattern for web-based mapping that can provide scalable, high performance mapping on low cost hardware. The design pattern is a three tier architecture, comprised of a client, typically desktop, tablet or hendheld running a web browser, a middle tier where pre-rendered map tiles are cached, and a data server, where geospatial and other data is stored. The reason that this is such a successful architecture for low cost, high performance computing is that navigation operations, panning and zooming, only require loading and unloading cache tiles and do not require accessing the data server. Since a pan or zoom operation can involve typically a thousand features, loading a few tiles is much more efficient from a CPU and I/O perspective and dramatically reduces the load on the data server. The other key to this architecture is that the user only updates the data store, never the cache, so there is only one point of truth. 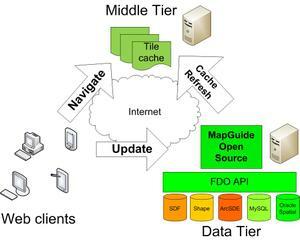 The cache is refreshed by a background process running in the middle tier or data tier. Autodesk announced that it has signed an agreement to acquire substantially all of the assets of the 3D Geo GmbH. 3D Geo is a leading provider of geo visualization and software to create, analyze, manage and distribute large-scale geospatial information. Based in Potsdam, Germany, the company is a fast growing business that is best known for its dynamic virtual 3D maps and city models. The Premier of Ontario has announced that the Province has committed to protect 50% of the Province's intact northern boreal forest, amounting to 225,000 square kilometers, or 43% of the land mass of Ontario. This region of Ontario absorbs approximately 12.5 million tonnes of CO2 annually. The northern boreal forest covers about 35% of Canada's total land mass. I have received a number of queries asking when and where the CS-Map source code will be available. It is available now and you can find it at CS-MAP source tree. Microsoft has announced the Release to Manufacturing of SQL Server 2008. From a geospatial perspective the most important aspect of SQL Server 2008 is spatial data types and spatial indexing. At this point, all the major relational database management systems (RDBMS) are geospatially-enabled, including Informix, Oracle, MySQL, DB2, and PostgreSQL (with PostGIS), and I believe that Ingres is in the works. FDO is an open source API allowing desktop and web-based applications to read from and write to a wide variety of geospatial datastores. The FDO Data Provider for SQL Server 2008 has been available since February, 2008. Autodesk has announced another major software donation to the Open Source Geospatial Foundation (OSGEO) . The source code for the CS-Map coordinate system technology acquired from Mentor Software has been donated to the open source community and Autodesk is working to make it part of an official OSGeo Foundation project for coordinate reference systems. This is Autodesk’s third major contribution to the open source community, after the Feature Data Object (FDO) Data Access Technology and MapGuide Open Source donations. CS-Map is a coordinate system and map projection library for geographic coordinate conversion. More than 3,000 map projections and coordinate systems are currently supported. Because it's now open source, contributors from the the open source community will now be able to customize and add to the existing projections. Autodesk acquired CS-Map through its acquisition of Mentor Software technology in September 2007. 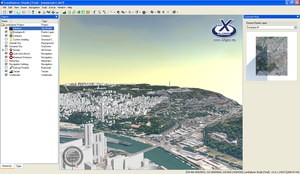 CS-Map is currently embedded in most of Autodesk's geospatial products. The OSGeo hosts 15 open source geospatial projects. Since OSGEO's founding in 2006, more than 200 developers have contributed to OSGEO projects, and it includes a base of more than 6 million lines of code, representing more than 1 000 person years of effort. The MapGuide Open Source project also announced the addition of MapGuide Maestro, which is a free map authoring tool for MapGuide Open Source.